Many of us in this industry have sometimes thought about building a team of hand-picked people. I’ve done it my whole career; a lot of times in meetings where my mind wanders a bit. Who would I want with me in a fox hole? The young account executive across the table who routinely knocks it out of the park and is full of potential and love for the work. Fox hole. The art director at the other end of the room who has lost the passion for what we do and now routinely phones it in. No fox hole. A lot of us give thought to starting a team, but I’m not sure how many give thought to starting an office—the physical space where the team will sit and work and spend countless hours together. The Rochester office of The Martin Group represented both opportunities. Opening four years ago with just me and Duane Bombard, we chose the location based on where we lived. The village of Victor was about the halfway point—close enough to both of us and close enough to Rochester to make it easy to meet with clients. What started as a two- person office soon grew to be three and then four as a few of our past colleagues jumped into the fox hole. Soon, the small office was too small and we took the opportunity to move into a larger empty space at the back of the same building. This space was three times larger; we gutted it and it became a blank canvas to design to our liking. We didn’t hire an interior designer or space planner. I took the role on myself, working with the building’s general contractor. Beyond the function of the space, I wanted our environment to cast the right feeling. I wanted it to reflect not only who we are as an agency, but my personality and Duane’s, and to reflect the way we approach our business. Yes, I wanted the space to feel modern, but also warm and comfortable, with touches of true craftsmanship and charm. Our three shades of gray walls, silver/white/walnut furniture, dark hardwood floors, and gray geometric carpets give the space a modern flare, but I think most people feel at home in our space with touches like our reclaimed wood, sliding barn-style conference room door. It adds a comfortable, unpretentious element that makes the space unique in our building and sets a tone for our agency’s personality. 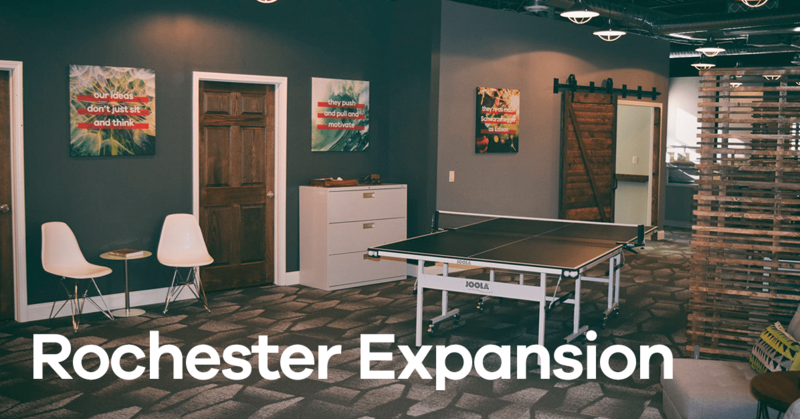 Obviously, the physical growth is driven by business growth and the way that has happened is one of the most gratifying aspects of the entire TMG Rochester experience. As our team worked to support TMG Buffalo’s creative needs, clients that Duane and I had established relationships with in the past began to come on board. And by word of mouth and based on the quality of the work, those turned into others, and the four-person office soon became 11. I would never want our physical space to hinder growth, so when an adjacent office became available, we tore it down to the studs and built it back up to work seamlessly with the existing office. We doubled our seating capacity, and added more meeting spaces and some additional flare and fun. Along with the modern décor and elements of craftsmanship—like a wood accent wall comprised of 1200 walnut-stained angled wooden blocks—the new space gave us the opportunity to add some essentials that were previously missing. Now, in the center of our new space sits a ping pong table and a dartboard on our 12 ft. cork wall. Yes, we sometimes use that for work, pinning up concepts in progress, as well. Thanks to Tod Martin, TMG Rochester has always been part startup—from our earliest incarnation with just Duane and I, one art director and one writer—and part established agency with the power of a full-service firm under one roof, even if that roof extends 80 miles down the thruway. That is reflected in our office. We like to think it has the energy of a startup and the sophistication that has always been a hallmark of The Martin Group brand. It’s pretty comfortable for a fox hole. is Senior Vice President, Executive Creative Director and the Managing Director of The Martin Group’s Rochester office.